Do you love your cell phone? How about movies or your digital camera? Thomas Edison invented early versions of these modern marvels. He also invented the electric light bulb. Imagine how different life was before his inventions. The only way families could communicate with each other was through letters, which could take weeks or even months to arrive. For light, people used candles or oil lamps, which were smoky and messy. 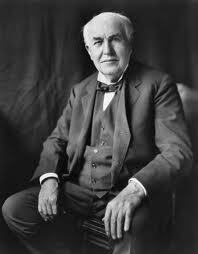 All About Thomas Edison: He was born in 1847 in Ohio. Edison’s inventions and improvements on already invented equipment let people live more comfortably. His inventions provided entertainment. The telegraph let people send messages quickly. In war time or emergencies, telegraphs saved lives. When the Titanic sunk in the Atlantic Ocean, a telegraph alerted rescuers to the disaster. But Edison wasn’t always a brilliant inventor. 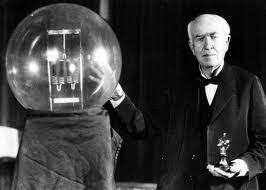 He invented the electric light bulb. He was a busy, curious boy who got into trouble at school. His teacher called him “addled,” which means slow or dim. Edison’s mother was frustrated with the school. She knew her son could learn. She decided to teach him at home instead. Her ideas worked. Before long, she had taught Edison everything she knew. He started reading books from the library and teaching himself. Edison was born in 1847 in Ohio. He was the youngest of seven children. Edison’s mother let him set up a chemistry lab in the basement, which made his father very nervous. Thomas Edison had scarlet fever when he was a child. The disease left him almost deaf. When Edison was twelve, he started publishing and selling a newspaper to train passengers. Edison started a fire on a train car doing chemistry experiments. He was kicked off the train. At age fifteen, he began operating telegraphs. At age 22, he invented an improved stock ticker for the stock exchange. He was paid $40,000 for this invention – a lot of money back then. Edison used the money to take care of his ill mother and become a full-time inventor. 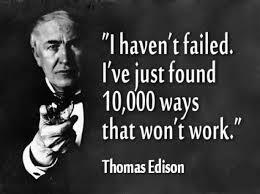 This is the most famous quote of Edison. A video of a short biography about Thomas Edison. Question: How many things did Edison invent? Answer: Edison submitted his last invention for patent when he was 80 years old. He had 1,093 inventions. Enjoyed the Easy Science for Kids Website all about Thomas Edison info? Take the FREE & fun all about Thomas Edison quiz and download FREE Thomas Edison worksheet for kids. For lengthy info click here. Declan, Tobin. " Thomas Edison Facts for Kids ." Easy Science for Kids, Apr 2019. Web. 20 Apr 2019. < https://easyscienceforkids.com/all-about-thomas-edison/ >.